MX48 Series | Japan Aviation Electronics Industry, Ltd. Along with the electro-mechanical advances taking place in cars, the number of parts used is increasing and there is a demand for more compact electrical units. At the same time, the use of displays is growing due to DVD watching in the back seat, safety checks using a rear monitor, and LCD type instrument panels. And as the displays become larger and high-definition the signal used is shifting from analog to digital high-speed differential transmission, which can transmit large amounts of data more efficiently. To meet these demands, JAE has developed the MX48 series product and achieves a 48% reduction in volume. It is also compatible with GVIF and LVDS transmission, which are ideal for the transmission of video signals in cars. * GVIF is a trademark of Sony Corporation. Achieves 48% reduction in volume compared to our previous product. 2.0mm side pitch, 2-position signal lines. Compatible with GVIF and LVDS transmission. 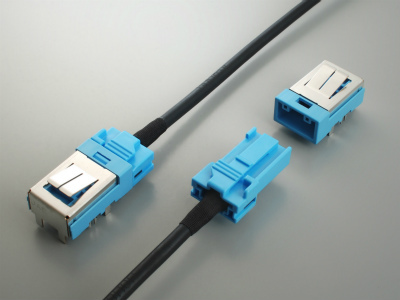 Impedance matching design, compatible with high-speed transmission. Mechanical lock and twist-resistant structure for mated connector. Dual-shield structure with ground terminals for EMI control. Available as a completed harness to ensure transmission performance reliability.